I saw these as I was biking home the other day, and was struck by a few things. I liked the primary colors and thought it was cool how these carts were just sitting around like this–each one from a different store. On another level, I think this image says something about our modern consumer culture. I took this photo on December 18, but am putting it up the week after Christmas (I usually take my photos for this blog a few weeks in advance) because right about now is when things are returning to normal after the brisk shopping season that has just ended. Kids are back in school, parents are back at work, and all the presents and gifts that a few days back seemed so fresh, new, and exciting are beginning to gather bits of dust as their owners begin to move on to other things. 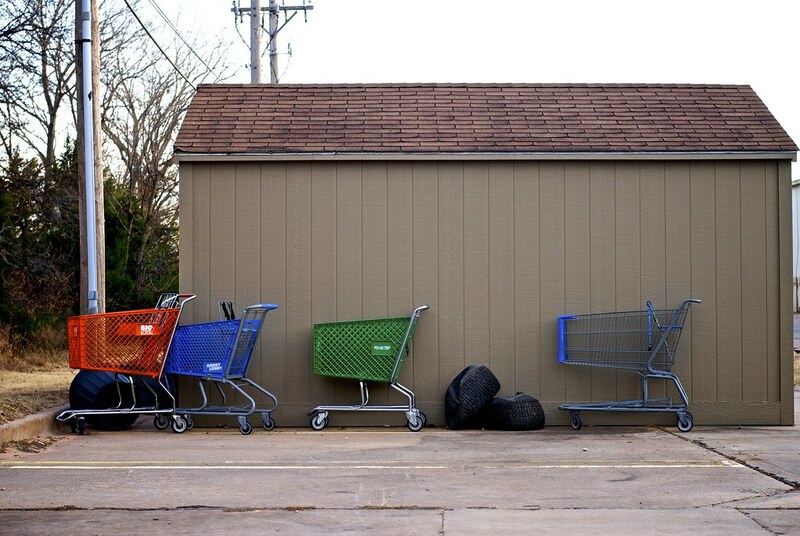 Like these shopping carts, unused and neglected in the back of a parking lot, soon the gifts and presents which they once contained will also be relegated to toyboxes, closets, and possibly even garbage bins. And in eleven months we’ll do it all over again. Something to think about the next time we feel the need to load up our shopping carts with ever stuff to buy. Stuff that will ultimately matter quite little in the long run.